Where was the public outcry when Palestinian cartoonist Naji al Ali was murdered in London in 1987. Where was the outpouring of grief for this renowned artist? Where were the calls for freedom of speech? “On Wednesday July 22 1987 at five in the afternoon, Palestinian cartoonist Naji Al-Ali parked his car in southwest London, and walked a few meters towards the offices of the Kuwaiti newspaper Al-Qabas where he worked. He was shot in the head by a gunman, dressed in a denim jacket, who walked calmly away down Draycott, near Sloane Square and vanished. After five weeks in a coma on a life support machine at St Stephen’s hospital and the neurosurgical department of Charing Cross hospital in London, Naji al-Ali died at 5am on Saturday, August 30, 1987 at the age of 49. “Don’t say anything against the honest people, otherwise we will have business to sort you out,” the caller continued. 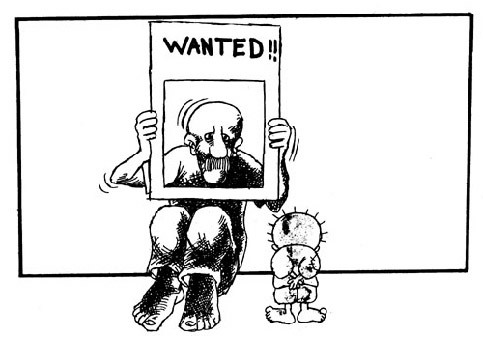 Naji al-Ali ignored the warning and published a cartoon lampooning Arafat and his henchmen on 24 June. Naji al-Ali is one of the most influential commentators on Palestine. His works influenced all kinds of people, who used to wait impatiently every morning, to see his drawings on the last page of many Arab dailies. Every cartoon that al-Ali drew, featured his famous hand-made character-the bare-foot little boy ‘Hanthalah’ who turned his back to the world and who became a trademark throughout his long career. The idea came to him when he was working in Kuwait during the early 1960s. “I created this character to symbolize my lost childhood,” he said. Frequently detained by police and frequently censored, al-Ali was expelled from Kuwait in 1985. He moved to London where he continued to work until he was shot. Naji Al-Ali’s death marked the end of an era, and ironically the beginning of the Intifada in occupied Palestine. The late Palestinian novelist Ghassan Kanafani, who owned al-Horiya magazine in Lebanon, and who was assassinated in Beirut in 1971, saw some of his drawings and encouraged him to continue, and eventually published two cartoons in his magazine. The years spent in the refugee camp influenced Naji al-Ali immensely, and it was there that he first witnessed the constraints imposed on the Palestinian people. He swore then to immerse himself in politics and serve the Palestinian revolution by all the means at his disposal. Al-Ali was originally trained as a mechanic, but his first love was always drawing, which led him to a one-year art course at the Lebanese Art Academy. It wasn’t until later, when he worked as a journalist in Kuwait, where he first worked as an editor, reporter, and even as a secretary, at Al Tale’ah weekly magazine. “I was able there to express my feelings and thoughts through the medium of cartoons.” Al Ali said. He often defined himself as a realist, one aligned to his social class, the poor. This point of view was apparent in the majority of his cartoons. “The poor people are those who suffer, are sentenced to jail, and die without shedding tears,” al-Ali once said. Later on, he returned to the old camp in south Lebanon, and found work with Al-Safir newspaper, but he was dismayed at the change in attitudes. “When I left the camp, everyone held dearly to the idea of liberating the whole of Palestine, but on my return, I found that people were content with liberating less than half of it,” al-Ali was once quoted. He thought that the pursuit of money was responsible for the change in principles. During the Israeli invasion of Lebanon in 1982, Al-Ali was forced to leave his home again, but this time on ships filled with hundreds of Palestinian fighters. After several years of displacement, he finally settled back in Kuwait, where he found work with the prominent Arab daily, Al-Qabbas. He soon found pressure and threats from certain political groups, and was forced to move to Al Qabass’ branch in London. It was his last move before his death in 1987. Naji Al-Ali used only simple lines and traces to depict his ideas and thoughts onto paper. His works and thoughts were impressive and unusual. In 1992 an Arabic motion picture about his life was made. The movie “Naji al-Ali” featuring Egyptian actor Noor El-Sharif gained widespread admiration and respect from around the Arab world. Ten months after Naji al-Ali was shot, Scotland Yard arrested a Palestinian student who turned out to be a Mossad agent. Under interrogation, the Jerusalem-born man, Ismail Suwan, said that his superiors in Tel Aviv had been briefed well in advance of the plot to kill the cartoonist. By refusing to pass on the relevant information to their British counterparts, Mossad earned the displeasure of Britain, which retaliated by expelling two Israeli diplomats from London. A furious Margaret Thatcher, then prime minister, closed Mossad’s London base in Palace Green, Kensington. Undeterred by the British reaction, Mossad used forged passports of another Western government to send its agents to Tunisia to lay the groundwork for the assassination of Abu Jihad. Israel and Britain had been in contact for several months via diplomatic channels concerning Suwan’s revelations that he had worked with the Mossad. Newspapers reported that the action was partially a result of accumulating British grievances against the Mossad, including the abduction of Mordechai Vanunu and the use of British passports, found in a phone booth in West Germany in 1987. However, despite the arrests by Scotland Yard and an investigation by MI5, the assassin’s identity has never been revealed. Throughout history artists have faced the threat of violence when their work offended the state or the political elite. 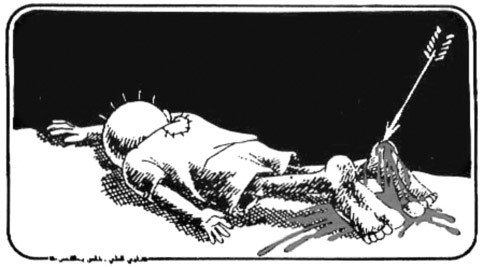 The late Palestinian cartoonist Naji Al-Ali produced thousands of cartoons satirizing the powers that be in the Middle East, and paid the ultimate price for his expression. ← Paris March of Hypocrisy – Omar Ghraieb, Gaza.